« SHOP and support Girls Inc. at the same time! The quadruplets have arrived at Girls Incorporated of Owensboro Daviess County. Two of the four new Girls Incorporated transit vans park in front of the RiverPark Center on December 22 as children from the organization unload to take a tour of the facility. The vans were purchased with grants from Impact 100 and the Marilyn and William Young Foundation and replace older, aging club vehicles. Photo by Greg Eans. 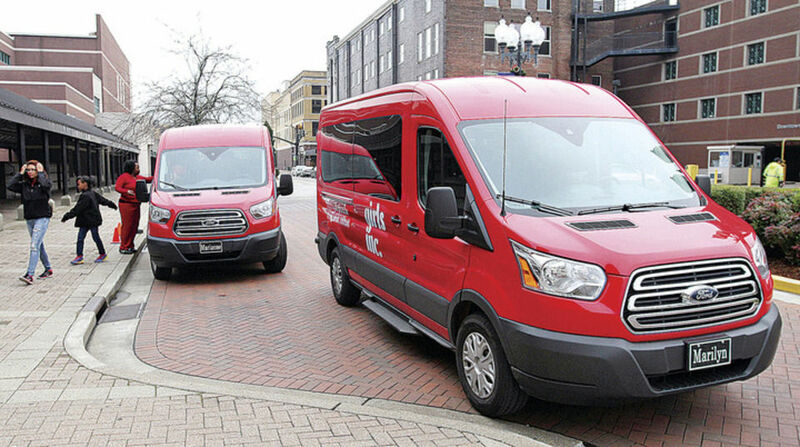 Four bright red transit vans, purchased with grants from Impact 100 and the Marilyn and William Young Foundation, replaced the organization’s aging vans, affectionately called Me Maw 1 and 2 and Granny 1 and 2. The new vans have been dubbed Martha, Marianne, Marilyn and Bill in honor of the founders of the foundations. The club’s old vehicles, which were 10 to 15 years old, had more than 100,000 “stop-and-go miles,” CEO Tish Correa Osborne said. With the wear and tear, and safety issues, the amount the organization was spending on repairs was “killing our budget and putting us and our kids in a bad situation,” she said. “It’s such a relief for us,” she said of the new vehicles. Girls Inc. travels more than 30,000 miles a year on field trips, transportation from school and drop-offs at home, said Osborne. Osborne is hopeful the vans will last through the next decade. By that time, “hopefully we’ll have an endowment built up” so purchasing replacements won’t be so difficult, she said. According to a press release from Girls Inc., three of the old vans went to two other organizations and the fourth was used as trade-in. There was an additional curriculum component with the Impact 100 grant called Girls Under the Hood, where the girls learned about cars, vehicle maintenance and care, tips on how to purchase a car and more, according to Osborne. “It’s been a real community effort to make this possible for the girls,” she said.